EL 03/07: What can we do in the time that we have? I would prefer to spend the time to hit the Rough notes, otherwise at least getting some more OS hip shifts on Soren (that would translate/overlap up through his torso, and the snake) as he stumbles through his footfalls a bit with the surprise of the impact and the mere fact that the snake is here. We just feel too locked on our mark here, so I am looking for anything to make the moment play more real at Soren's core. 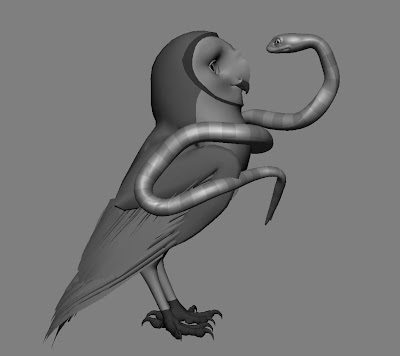 Also, need to continue to refine overlap on the snake relative to Soren, and snake lip sync. Soren can still have a bit more incredulous default facial, with occasional smile coming in, weight it still more toward incredulous (eyes wide, mouth agape) particularly toward the end. Copying previous notes just to track them: EL 02/07: Let's get one more pass before Rough, refine snake sync, and crank incredulous where you can, esp, with Soren's broken up, shuddering, gasping breathing. Make sure this breathing comes from his core and that the rhythm does not get too even. (time-wise, focus on the end.) The look to cam still plays odd, too defined in and out, too present (almost plays like embarrassment) Try breaking it up in steps, and spread it out longer, perhaps use body rots more in the turn as well, but trailing one step behind the head... and counter animate the snake head position back in world-space to keep the same read/ focus on her as he shifts around underneath. Also, still need more wide-eyed, jaw dropped incredulous on Soren's look to the others. My heart sank as I saw the large amount of text next to my shot. His opening statement suggested he wasn't really happy with it, that he was just looking to for improvement in the time left and had given up on getting the shot he really wanted. I had just one day left to work on the shot. Realistically I couldn't change it very much in that time. Had I made a disastrous mess of the shot? And the snake sync note again, I'd gone through it and it looked pretty dead on in terms of timing, what was going on? Was it possible I had the wrong audio in my shot? This had happened a few times on the project, an update gets missed along the way and someone has to redo animation due to them having the wrong audio. Had I just spent 7 days animating to the wrong dialogue? My old camera had a slight drift on it which had subconsciously given the illusion of Soren moving around more. The new one was more locked and I could see it made him look very still. My co-ordinator arranged for me to do an upload to him at lunchtime so he could see where I was at and prioritise what should be worked on. I grabbed the translate null and Soren and tried to find places where it felt appropriate to move him. This was tricky as he had to end up in the same place so that Mrs P's position would stay the same at the end of shot. So every time I moved him forward, I had to find an opportunity to move him the same distance backward. I had got the note to make him incredulous again, I clearly still wasn't getting this right. So I decided to be brave and push it as far as I could, and just have his mouth wide open for most of the shot, I also exaggerated the head shake I had in there and submitted again. BB: have tried to loosen him up a bit, moving him back and forth to address the "locked on our mark" note, weighted expression toward open mouthed default. Hoping to spend rest of day pushing chest and snake overlap. Not sure what to do about snake sync note, Andrew and I went through it yesterday and I made some adjustments, looks pretty tight to me now. Which bit is the problem? Is it possible you have different audio? EL 03/07: Great progress! 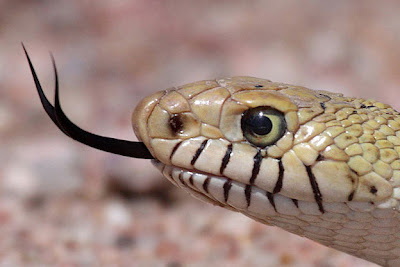 Sorry Brendan to clarify, the snake lip sync felt a bit steppy and off-model for Mrs. P's normal asymmetry…run it past Christian S and see if he has any pointers. Do your work today and submit Arbs for Rough approval. Wow. My quick fixes had been enough, to lift the curse off the shot, I could now see that Soren's mouth being open affected it greatly, he now felt genuinely shocked at the Mrs P being there and his spluttering and trying to speak was working better. My crude translating around was working better than I had thought it would and made Soren feel more looser and more natural. I fixed Mrs P's mouth shapes in a clean-up pass and that was it- the shot was done! I want to be clear that I don't think this shot is a masterpiece, when I look at it now it seems obvious to me that the shot was done quickly and has been kept relatively simple. If I had had longer I might have attempted a more dynamic and exaggerated stumble on Soren, and not keep him so side-on throughout the shot but I think for how quickly it was done it's reasonably successful. It was quite a roller coaster ride to get it out in a week. I was pleased that I had turned it around to something the animation director was happy with. It's funny looking back now, at the time I felt I had to make some pretty big changes to the shot but in fact the physicality of the shot changed little from my initial sketches and first block to the final version. The intent and energy of the characters was lacking in my initial approach but this was something that was layered over the top of the action. It's also strange to look back and remember how upset I was when I thought it was going badly. It was an intense week and the tiredness I was feeling at the time certainly was a factor but also, as an animator you have to invest a lot of yourself into your job. It's almost impossible to detach yourself from your work and put it out of your mind, or resign yourself to producing an unsatisfactory shot. Animation is a consuming occupation which can contribute to your life in positive and negative ways. After all, the fact that we care so deeply about our work is the main motivation behind working such long hours. Thanks for reading. A huge thank you to my sister Frith for acting as editor for these posts and also to Eric Leighton who very kindly allowed me to use his notes. I would also like to thank Spungella and On Animation for recommending this story on their blogs. EL 01/07:Yep, carry on… the breathing should make a BIG difference on Soren's emotional state, act out big, broken and shuddering incredulous breaths and see how they drive your core, so the snake would be going along for the ride on some of the hits of his reactionary breathing body movement. Also, make sure the look to cam in your dead spot is a bit more incredulous, currently it's a tad on the goofy side. Soren should still be breathing at the end which would carry over into the next shot. Cool. Looking all good I thought. Ok, so he wants the breathing to be more accentuated, that was a bit more than I was thinking but it was achievable. Looks like he’s happy with everything overall, I can start to lock things down. So I added some breathing and tied down the animation and I finished splining everything out, I felt pretty happy. I had three days left of just refining and polishing what I already had, I might even finish this shot early! I felt I could relax a little and start to enjoy the process of animation. I always love finding places to incorporate the more traditional principals of animation to my shots even if they are in a relatively realistic style and one idea I was looking forward to playing around with was using Mr's P's body to go from straight shapes to curves. Going from a straight to a curve is always desirable in animation, it adds life and visual interest to the shot. However, there is often very little opportunity to use the idea as literally (especially in naturalistic animation) as when you have a character's body that can be simplified into a single line of action. A straight line held for a long time would not look particularly natural for a snake so I only used it briefly, holding for just a couple of frames at high energy moments. I saw two suitable occasions - one when Mrs P. jumps toward Soren and another on Mrs P's "snatched" accent; moments that would benefit from extra energy and impact. Another idea I was keen to incorporate involved the lip sync of the Mrs Plithiver. Lip sync is another great place in animation to experiment, I find that the character's mouth shapes must be accurate in terms of timing and the shapes must be clear, but due to something called the McGurk Effect liberties can occasionally be taken with which shapes you use. 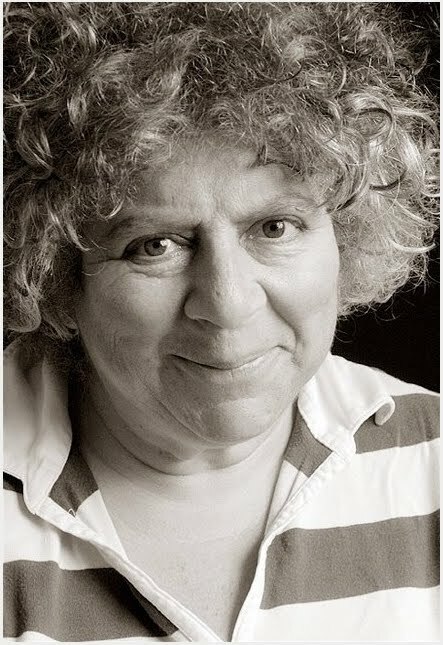 I really liked the way the actress, Miriam Margolyes, had read the part of Mrs Plithier. She had subtlety implied not only the age of the character but also added some accentuation to the 's's and 'th's of words. This gave it a nice snake-like quality which was something I wanted to emphasise. Snakes flick their tongues out to taste the air and I wanted to incorporate this to Mrs P's character but instead of having her doing it arbitrarily I looked for places in her speech. I had started to play around with the idea in a previous shot and had found that it would occasionally work if applied to 'th' sounds even though Miriam's tongue was not visible during the reading of the line. If you listen you can hear the nice accentuated 's' sounds as well as the 'th's in 'then' and 'this'. Close up showing tongue flick on 'this'. I would also have to remove the way Mrs P's body was sliding around on Soren. I'd found no other way to do this but by eye; line up one of Mrs P's stripes with a point on Soren and laboriously key every frame, using the translation of a control at the u-turn on the far side of Soren's body. However, I would leave this job to last. I spent Wednesday and Thursday working into the animation then submitted this version with the following comments. BB: All splined! also added breathing and changed look to camera. To come - remove sliding around in Mrs P's body. Push Soren's breathing at end of shot more. Other general refinements. EL 02/07: Let's get one more pass before Rough [animation approval], refine snake sync, and crank incredulous where you can, esp, with Soren's broken up, shuddering, gasping breathing. Make sure this breathing comes from his core and that the rhythm does not get too even. (time-wise, focus on the end.) The look to cam still plays odd, too defined in and out, too present (almost plays like embarrassment) Try breaking it up in steps, and spread it out longer, perhaps use body rots more in the turn as well, but trailing one step behind the head... and counter animate the snake head position back in world-space to keep the same read/ focus on her as he shifts around underneath. Also, still need more wide-eyed, jaw dropped incredulous on Soren's look to the others. BB: new camera, spent a few hours trying to rotate Soren's body and counter Mrs P. but in vain, sorry, would need a couple of days for this. Broke up the head turn to hopefully feel more natural and changed expression. Tweaked Mrs P's lip sync, tried to push breathing a bit more, pushed jaw dropped expression to others at start. I had just one day left on the shot, if Eric didn't like this new version, there would be little time for me to remedy it. I was now feeling extremely run down which meant my emotions were heightened, at times I felt hopeless and upset that I seemed to be failing at this task, all the worse as it seemed to be going so well just a few days earlier. This post follows on from part one of the story, if you would like to read it first it can be found here - Part 1. To explain our review process on Legend of the Guardians at this time, our Animation Director was working remotely from LA while we were working in a different time zone in Sydney, Australia. We would send a movie of our work off to Eric Leighton in the evening with some notes that stated what we'd done and where we felt we were with the shot. Then Eric would review it during his daytime and send his notes back to us so we would have them when we arrived at work in the morning. He would then be available for questions, clarification and additional reviews via video link until around our lunchtime. 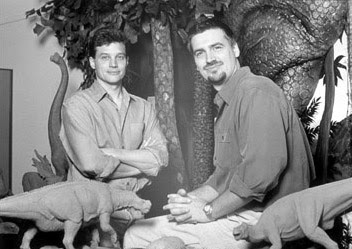 Publicity shot of Eric Leighton (left) with Ralf Zondag, Co-Directors of Disney's Dinosaur. Although my idea for the shot seemed to work to my eyes I was a bit nervous about Eric's reaction, I had not had a chance to discuss in detail what I had planned for the shot. What I was proposing was quite extreme and there was a chance he wouldn't like it at all. He might feel that the embrace by Mrs P was too nimble for an elderly character or that the hug felt like a constriction. I thought there was a strong chance I would have to start again with only 6 days left. now? Maybe he was hoping for something closer to the old version? It turned out that I'd neglected to submit my comments on the shot and Eric just wanted to get an understanding of what my intentions for the shot were before passing comment. Andrew, who had also just seen it submitted some comments for Eric, I don't have the exact words but he stated that it was my first pass block, he liked it but felt like Mrs P's collision with Soren needed more impact and Soren should stumble around after being hit. This was a good idea to add, it had been the proposed that Twilight and Digger's home was something of a bachelor pad with entangled roots all over the floor, to have Soren stumble would accentuate this. EL 28/06: Very interesting and cool first pass, I love the aggressive move from the snake… but totally agree, we need much more impact on Soren, both physically and emotionally. Physically, want the whole tripping backwards over the furniture thing, really shocked and taken by surprise. Emotionally he must be absolutely incredulous (as the audience will be) at the supreme serendipity of this situation, looking at the snake (and out to the room) with joy, shock and absolute disbelief. He liked it! Or at least was willing to go with the overall idea. That was a relief. I had to add some stumbling which would be hard but at least I wouldn't have to start over. For the rest of the day I tried to imply a stumble at the start, I increased the amount he was pushed back, which meant I had to adjust the camera as well. I had a tender moment in the previous version at the start, I removed this as it was going against the idea of being shocked and taken by surprise. I also tried to add a bit more surprise into his facial animation and added more breakdowns to define the movement I envisaged. 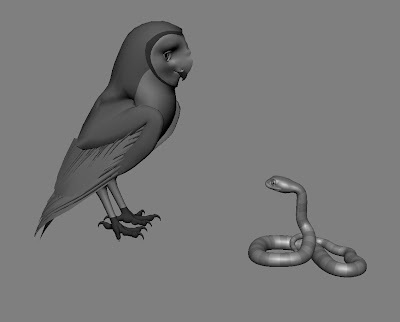 I also tried to get Mrs P's accents affecting Soren, trying to keep him loose while this excited snake talked at him. I submitted this new version with the following notes. (again hopefully will be clearer once in rough). EL 29/06: EL BLOCK APPROVED pending [render with motion blur] so we feel forward progress, but all intent notes apply, anything to point at the incredible, absolutely insane serendipity of the moment (head shaking, gasps, broken up breathing, starting to say something and freezing/sputtering in disbelief, more looking out to the room, etc, etc) Brendan I think you have a good feel for this, so mostly the note is carry on and give us as much as you can in the time that you have! Ok, he had approved the block of it and felt like I was on the right track but obviously I still wasn't getting enough energy and hitting the brief quite yet. However, my co-ordinator submitted a render of the latest animation. It wasn't very different but I had worked into the stumble a little at the start. I received these notes. EL 29/06: EL BLOCK APPROVED. Very cool progress on this one. Good news indeed, he had seen my latest version and was happy with how it was going, I felt like I could relax a little, now it was just a matter of fleshing it out and refining. I was also at the point where I was trying not to work into anything too far in case Eric might want something different, I really wanted him to sign off on the overall movement, I hoped the breathing, head shaking and spluttering could be ideas that I could layer-in while keeping the overall staging of the shot the same. When I submitted the shot that night I tried to hint that it would be great to get Eric to sign off on the staging so I could move forward. BB: Wip rough - have splined and worked into stumble, also added head shaking, trying to talk, etc. Still to add breathing and splined facial. If you're happy everything is here I can start to tie down and finesse. To try and give a bit of insight into the life of a professional animator, namely mine, I've decided to write about a week during the end of my previous project - the animated film Legend of the Guardians. As I began to write and it became rather extensive, as is often the case, I've cut it into a series of four posts which I'll upload every Monday for the next three weeks. I’m hoping this will make an interesting story for you to follow, give you an insight into what working life can be like and give you an idea as to how I work. I call it 'A week in Crunch'. 'Crunch time' is the last couple of months at the end of a project. It usually involves very long hours and working 6 or even 7 days a week. There is a high level of stress and everyone gets tired and grumpy, ill, dishevelled and generally worn out. Work pretty much consumes your brain, it's all you do so it's all you talk about and although incredibly tired, you often can't get to sleep at night for thinking of it. However, it can also be quite an exciting time as well, things come together very quickly and everyone can start to see the end of the project in sight. The film you may have been working on for years is finally almost finished! I should make it clear the level of hard work I talk of was not unique to me, everyone around me was working equally hard during this time. I'm also not trying to criticise the animation industry or the faults in the work practices the animation companies employ. Generally at the start of a project, time is more flexible and there is much less stress. The push at the end of a project is almost always necessary and part of the job of an animator. Another motivation for writing this is that I find there are many unrealistic examples which show the animation process as a smooth, seamless evolution from blocking to working into the animation then to polishing. In my experience the reality of the process is rarely that straightforward. Occasionally you'll get a shot for which you and the animation director are totally in sync, which you face no technical obstacles and the journey of shot production is a smooth one. More often than not it's a balancing act - you are trying to move the shot closer to a finished state whilst incorporating the ideas the animation director has for the shot. At the same time as battling with any technical problems you may have, trying to progress your own ideas and wanting to make it look as good as possible. All of this with a deadline looming. You have to stay flexible, and willing and able to make large changes very quickly. All notes given by the animation director are real and all events are true to the best of my recollection. The deadline for animation on Legend of the Guardians was 18th July 2010 but we were delivering the large portions (or spools) of the film before that. 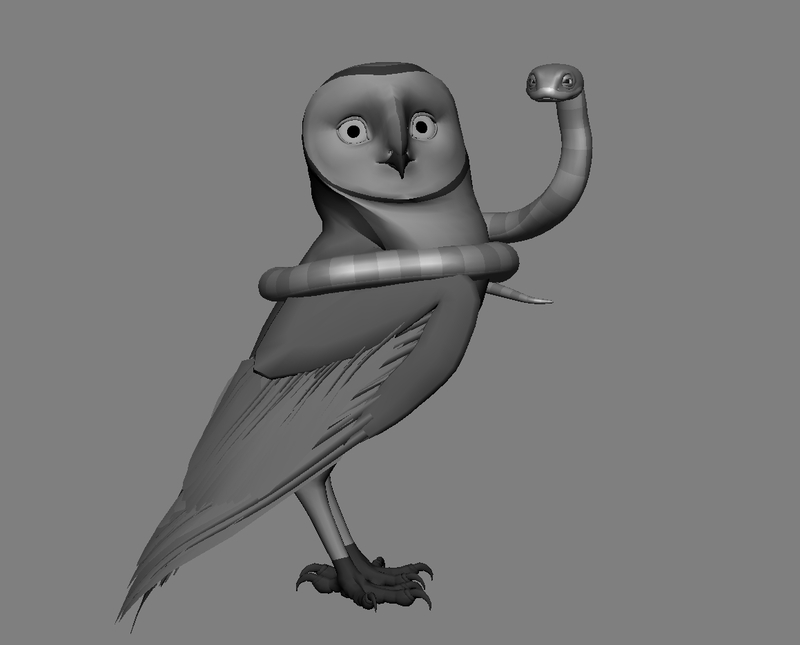 As the first spool delivery approached, animation for it was to be finished by Saturday 3rd July. The following story charts my week leading up to this deadline - from Saturday 26th June to the end of Saturday 3rd July ... which technically is 8 days and not a week but who's counting. During these 8 days I worked 98.5 hours, starting at 8.30am each day and staying late (past 6.30pm) every night, working past 12am on a couple of occasions. I was a lead animator on the project with my own team, however there was a sequence for that first spool that, because of unforseen curcumstances, was in danger of running out of time which belonged to another team. Unfortunately crunch time is also when things start getting brutal, it's horrible to take shots away from an animator but sometimes that's the only way they're going to get done on time. 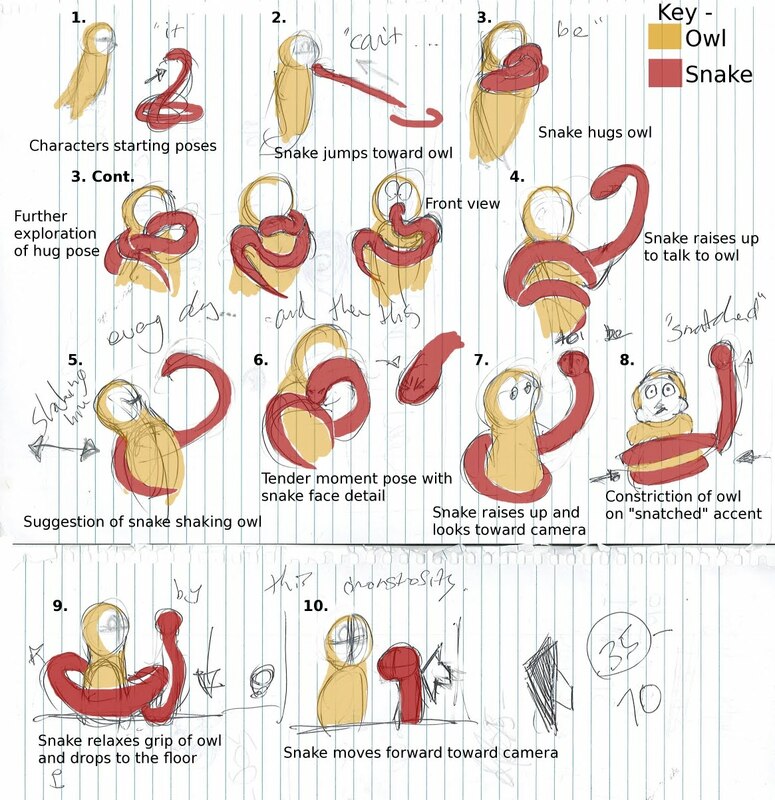 There were a few shots in the sequence that the animation director Eric Leighton needed executed differently and the film's production crew were not confident they would be completed in time. It was decided that the senior and lead animators should be reassigned to these shots. At the end of production like this there is usually some last minute hiring, animators brought in and thrown into a production, forced to very quickly adapt to the animation style, working methods, rigs and characters. It's very much a sink or swim situation and it's terribly unfair not to be given time to settle in. The shot I was given was re-assigned from an animator who was hired late in the project and had little time to get up to speed. I had worked on the production for over a year and a half by that time and therefore I was comfortable with the tools and the style of animation required. I had mixed feelings about being in this position, I felt very fortunate to be one of 'go to' animators on the project, someone the production felt could be trusted with complicated shots with tight deadlines but at the same time it’s difficult to be given another animator's shot. I've had shots taken away from me, especially earlier in my career, and it is always unpleasant and hard not to take personally. A later shot from the scene showing Digger and Twilight with Mrs Plithiver and Soren in the foreground. The scene in question, the introduction of Twilight, had been greatly affected by some last minute modifications to the story. One major change to the film that affected the scene was the decision that the hero (Soren's) parents should not be killed during the film. Up until a few months before the end of the film's production the story had Soren return home to find his family's hollow burnt and abandoned. It was a sad but very beautiful and powerful scene. This was also where Soren was reunited with his snake nurse mate, Mrs. Plithiver (or Mrs P.) who would then accompany him on his mission to find the mythical Guardians of Ga'Hoole. Now that Soren's parents were not killed and he didn't return home, there was the dilemma of how to reunite Soren with Mrs P. As removing her would have impacted too much on the rest of the film. It was decided that she could be reintroduced in this sequence by Twylight bringing her into his home as food for him and his hollow-mate Digger. Who had just met Soren and offered him shelter. Despite this the animation director Eric Leighton and lead on that sequence, Andrew Hunt had turned it into a great scene. The character of Twilight was strong, the animation was really beautiful and it was getting some great laughs in reviews. When I found out I was to animate a shot within it but had only a week to complete it I was anxious of the schedule but thrilled to be involved in such a great scene. 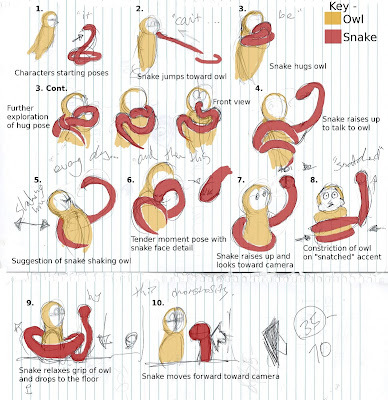 The shot I was given had just two characters, Soren, an owl, and the snake - Mrs P. Snakes, however, are notoriously hard to animate, their movement is obviously very different to other land based animals so Mrs. P's animation was going to be tricky - (for those interested in the technicalities) there were two modes to her rig, a straight forward FK mode which was incredibly hard to animate in anything other that a close up head shot or an IK mode which was easier in full body shots but had a one major draw back; she would be constrained to a path by her head but there was no way of locking down any point of her body which made it slip around as her head was animated, and the controls along that path would easily gimbal and cause pops in her motion. It had also proved hard to get appealing poses from her. When I picked up the shot the previous animator had played it much as it was in the original, dead-parent version - a tender, warm moment between Soren and Mrs P. This worked in the original story as the shot was quiet and underplayed and the reunion was against a background of tragedy. This new reunion was very different, firstly, it's obviously highly unlikely - To be introduced to a new character who is also carrying an unrelated character we have previously met. The animation director Eric Leighton suggested that instead of hiding away from the fact that this was a tenuous plot point and risk pulling people out of the story and ruining the illusion of the film, we should accentuate the serendipity by showing how shocked and amazed the character's reactions to the situation were. It was even suggested that we add a small knowing look to camera to further highlight that Soren couldn't believe that this was happening. Secondly, there was the extra complication of Mrs P changing gears through the shot, she started off in happy amazement then her emotions turned at the end of shot to anger at Twilight for capturing her. Mrs P : "It can't be! Every day I've been out looking for you and Kludd and then this ... to be snatched up by this monstrosity." I decided to be bold. If Eric wanted a big impact I'd try and give him one. I reckoned that if Mrs P was just about to get eaten but suddenly found a close friend, the exact close friend she was out looking for when she was captured, then she would probably launch herself at Soren and squeeze him tight. I thought it would be funny to have her shaking him with excitement as she tried to tell him what had happened. I also wanted to try and add some fun ideas in there, the look to camera for example. Also, throughout the film there had been moments when Mrs P. had hugged some of the owls but it had always been challenging to achieve, as snakes in the wild sometimes eat owls, it always felt like the snake was about to constrict the friend she had in her grasp. I wanted to play with this idea, firstly I wanted to make sure the initial grasp of Soren read as a hug and not an attack. But then I wanted her to give Soren a squeeze as she became angry, my idea was that on the accent in "snatched" she would be so focused and angry at Twilight that she would not realise that she had accidentally held Soren too tight. After a bit of brain storming I drew these rather crude sketches just to get something down on paper and out my head. These thumbnails were done very quickly and are very rough. 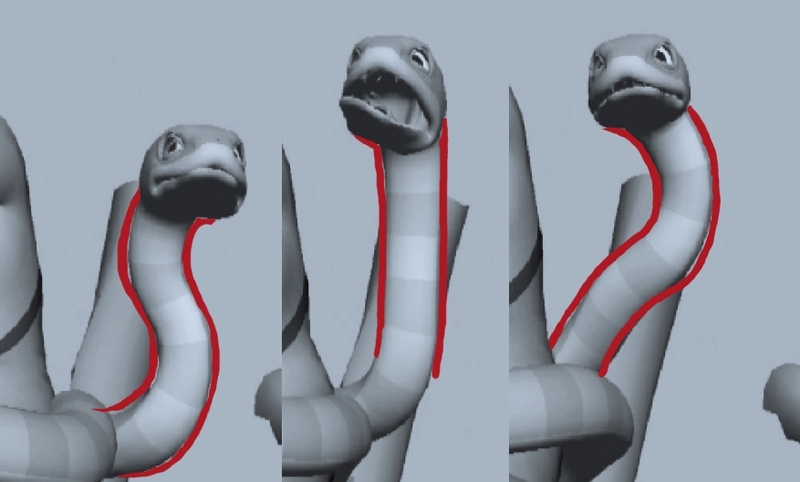 There is little focus on the details of pose and facial expression, they were mainly used as a means to visualise the physical movement of the snake throughout the shot. I've tried to make them a little clearer by adding notes and colour. I spent Saturday morning finishing off a previous shot and started this shot around lunchtime on Saturday 26th July. Firstly I tried out some poses to see what I could achieve with the snake, each pose was quite laborious to create, each node along the path had to be separately translated and rotated into position. I had to find out if my idea would work at all. I wanted to see if it would be possible to get the snake wrapped around Soren and position her so that she would still be able to look at him to talk to him. After some trial and error I came up with this, which proved it was possible at least. Mrs P's face would be very close to Soren's but this could work out well as she would be so excited to see him that she would lose all concept of normal personal space. 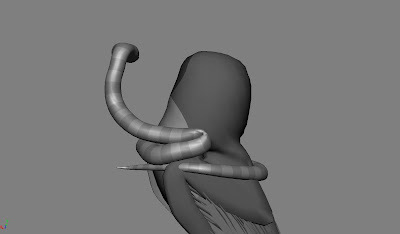 The idea was that eventually Mrs P's body would look like it was supported by Soren's wing, however, I left some space around this area as I wasn't exactly sure where Soren's wing and shoulder would be. The tail has also been left rather ambiguous. Next I tried a pose were she would be looking at Twilight with her body ready for the accidental constricting of Soren. I could only make one coil and it wouldn't quite fit round the widest part of his body, so I had her squeezing more around his shoulders / neck, but I thought this would still work. 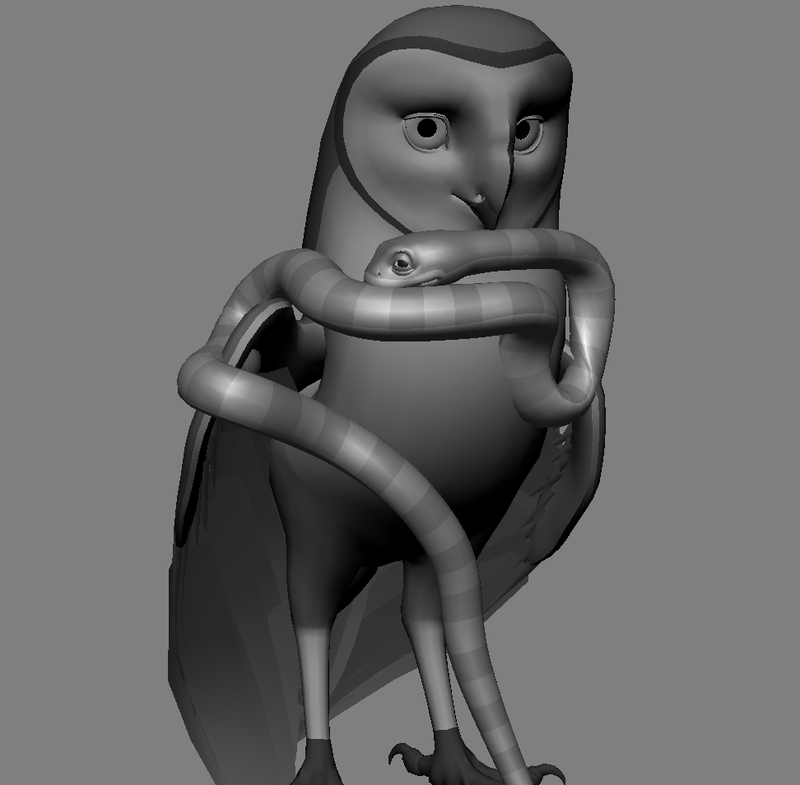 Then I created a rough pose for Mrs P. hugging Soren which would be viewed from his left. This took quite a while but finally it felt almost right - warm and friendly, hopefully it would not be confused for constriction of Soren. All these poses were cheated to a degree, there was an area on Soren's left hand side were Mrs P wasn't supported by anything and to get her wrapped back around I had to make a sharp u-turn there which created a rather ugly shape. But I figured that as the camera was on the other side of Soren we would never see this, and I'd stage the scene so Soren wouldn't turn his body too far towards the camera. Unattractive U-turn in Mrs P's body I would keep hiden from the audience. Finally I created the starting positions for the characters which would closely match the position we had last seen them in. I was reasonably happy with these as basic story telling poses and so reordered them, added a move back on Soren and a few more poses at the end for Mrs P dismounting Soren. I also had to create a rough camera for the scene, the original one was still and focused around where Mrs P started. With this camera she would immediately jump out of shot, so I added a tilt up and pan to follow the action. It wasn’t usual practice to create our own cameras on this production and it would have to later be refined by the studios lensing department. I made a capture of my work so I could view it in sequence. Although very rough, I was happy with my progress. I didn't submit this for review but this is where I finished up that Saturday night. I don't always work in stepped keys but as I needed to get an idea across fast and due to how long it took to pose Mrs P, it seemed like the best option. With such a tight deadline it was a relief to have something in the scene and I was happy with how my idea was progressing. On Sunday I tried to refine these poses a bit, add some breakdowns and some basic facial animation to help sell what the characters emotions would be. I then submitted it for review on Sunday night. But I would have to wait until the next day to find out what the Animation Director thought of it.